Maidan (Sergei Loznitsa). If the interaction of aesthetics and politics is a key theme that runs through the history of film criticism, less has been written about the place, in cinema, of aesthetics in politics. Leni Riefenstahl’s films immediately spring to mind but I’m struggling to think of other well-known examples. 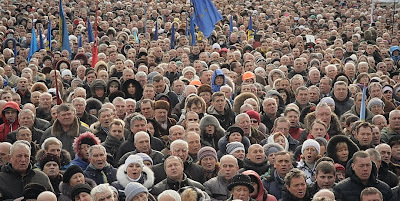 Maidan is an interesting entry in this discussion. It is a documentary that captures the events of the Ukrainian uprising at Kiev’s Independence Square over a period of a few months from late 2013 to early 2014. The film has a deliberate and conspicuous style: it is constructed almost entirely of observational, fixed-frame long shots and long takes. There is no voiceover commentary; there are no ‘talking heads’, no individuals singled out for attention, and only a few, minimal explanatory inter-titles. It also helps, no doubt, that Loznitsa—who directs here with rigor and authority—was raised in Kiev and lived there for years. What I found most striking about the film was the role played by aesthetics in the spectacle of revolution. Protesters chant and sing rousing revolutionary songs, often with inventive up-to-the-minute lyrics (the singers are almost never seen onscreen; the source of the singing is usually outside the frame); music, frequently percussive and rhythmic, surges up from the crowd; and what appear to be ordinary people—i.e. non-artists—come on stage to recite poems at the microphone. In an awe-inspiring moment, a riot rages on the ground while fireworks explode in the sky. Speaking of style, the film features an intriguing aesthetic choice: a profound but by no means obvious split between image and sound. We see ‘pure’ documentary images, in that they show, without re-creations, computer-enhanced imagery, etc., actual footage of the Maidan during the uprising. But what we hear is a dense and layered post-synchronized soundtrack built up, painstakingly, of over a hundred individual tracks. Now that I’ve learned this from interviews with Loznitsa (like the informative one that Richard Porton did with him), I am eager to see the film again, this time to pay closer attention to this rift along the fault-line of image and sound that has now opened up for me in my recollection of the film. It gives me pause that I did not suspect this radical disjunction—‘unaltered’ images vs. deliberately and artificially constructed soundtrack—while I was watching the film. Why was this so? 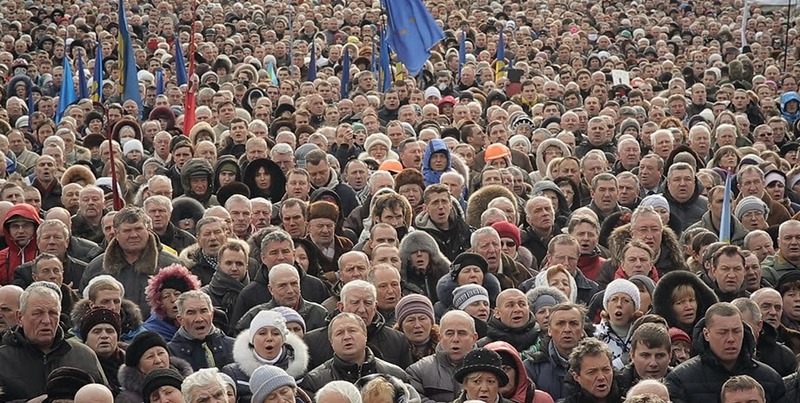 As a long-time cinephile interested equally in classical and modern cinema, I wonder: Why did I blithely take for granted the artificial ‘unity’ of image and sound in a formally bold film such as Maidan? As I ponder this question, I am reminded of film-sound theorist Michel Chion’s experiment in his book Audio-Vision, in which he takes scenes from two films, cutting out the sound track from one (Bergman’s Persona) and the image track from the other (Tati’s Monsieur Hulot’s Holiday), demonstrating in the process that our perceptions are altered dramatically when sound is stripped away from the image, and vice versa. He calls this mutual influence of image and sound the ‘audiovisual contract’. Shaviro adds that, surprisingly, the terms of this ‘audiovisual contract’ also apply in the case of modernist, formally audacious films—such as Godard’s Two or Three Things I Know About Her or Duras’ India Song—that play boldly with disjunctions between image and sound. Even as sound energizes images in these films, it continues to remain subsidiary to them. Shaviro proposes that recent digital ‘post-cinema’ (such as the Massive Attack music video Splitting the Atom, which he analyzes in detail in his essay) is giving birth to a new audiovisual aesthetic, while also changing the terms of the ‘audiovisual contract’ that have been in place for nearly a century. NOTES: Steven Shaviro's essay “Splitting the Atom: Post-Cinematic Articulations of Sound and Vision” will be published in a volume on ‘post-cinema’ currently being edited by Shane Denson and Julia Leyda; it will also appear as an ebook in early 2015. Jauja (Lisandro Alonso). It is a peculiar fact that the merits of a film are not necessarily correlated with how generative it is in terms of critical writing. There are certain acclaimed films (e.g. Mulholland Drive, Beau Travail, The Act of Killing, the work of Godard or Marker) that seem to inspire superabundant outpourings of writing, but there are others—solid, strong, potentially rich works—that, for whatever mysterious reasons, under-stimulate (or overpower) the critical imagination or the critical will to engagement. Andrei Ujica’s The Autobiography of Nicolae Ceausescu might be a recent example in this latter category; Jauja shows some early signs of making a modest bid for the former. When I first saw Jauja, I found it impressive and engaging, but it has grown enormously in my mind thanks mainly to the critical reading I’ve done on it since. (Three of the essential pieces on it so far are by Quintín in Cinema Scope and in Film Comment, and by Leo Goldsmith in Reverse Shot.) The basic outline of Jauja is probably well known at this point to most cinephiles who follow festival reports. The film has three sections. The first finds a Danish engineer (played by Viggo Mortensen) and his 15-year-old daughter in 1880s Patagonia, where he is part of the larger Argentine effort to conquer this land and wipe out its indigenous population. In section two, his daughter elopes with a young soldier, and he goes out alone in search for her, finding himself in increasingly desolate and hallucinatory landscapes. The final section is dream-like and enigmatic; the less I say about it the better. Jauja is the first Alonso film with anything resembling a conventional screenplay—written by the poet and novelist Fabián Casas—and many have pointed out that the first section of the movie contains more dialogue than all of Alonso’s previous feature films combined. Classical Hollywood and, more specifically, the genre of the western, are clear reference points here. Alonso uses a square Academy ratio, and the edges of the image are gently rounded as if they were photographs in an old album. The plot echoes The Searchers in section two, and the use of a Hollywood star is so striking that it becomes impossible to forget this fact—to make Mortensen ‘disappear’ into his character—while watching the film. All of this pulls the film into an interesting conversation with classical cinema. What emerges from this encounter is an overwhelming sense of all the frictions—all the multiple points of abrasion and resistance—between this film and the studio-era works that partly inspire it. I registered these frictions most acutely when Jauja was, paradoxically, closest to classical cinema. So, for example, the dialogue scenes, which take place mostly in the first section, lack a ‘smoothness’ of staging and cutting; they are disconcerting in their awkwardness. The staging is theatrical, with characters often rooted to the spot, their bodies stiffly angled non-naturalistically toward each other. Further, this theatrical aspect is rendered faintly ludicrous by the fact that the film takes place mostly in exteriors. Adding to the lack of seamlessness are the overt gaps of linguistic communication: the young lovers respectively speak only Danish and Spanish, and cannot understand each other at all. Even outside the realm of speech, the force of the ‘real’ erupts in small but striking ways. When Mortensen tries to mount a horse, the film emphasizes what a Western usually tries to play down: the frequent difficulty and gracelessness of the act, with repeated attempts, heavy breathing, grunting, all accentuated by the sound design. What happens ‘naturally’ in a Western is ‘de-familiarized’. There was a terrific and unpredictable joint Q&A with Alonso and Mortensen; they clearly have a great affection for each other. Alonso gave a lovely, succinct reason for why he makes films (“in order to learn about places and about cinema”), and Mortensen praised Alonso’s modesty, the sharpness of his eye and ear, and, most interestingly, “the luck he attracts while shooting,” by which he meant Alonso’s ability to catch or nail a shot even when so much depended on elements, such as the weather, that were outside his control. -- Adrian Martin on Mike Hoolboom at Filmkrant; and on Truffaut's Day for Night at Desistfilm. Related: Michael Pattison interviews Hoolboom at MUBI Notebook. -- A 2009 essay by Jonathan Rosenbaum, "Sexism in the French New Wave". -- Ignatiy Vishnevetsky on David Cronenberg's first novel, Consumed. Also: Calum Marsh interviews Cronenberg about his book. -- Brad Stevens on novelisations of films. -- Matt Zoller Seitz remembers the recently deceased L.M. "Kit" Carson. -- Michael Sicinski on Peter Watkins' 14-hour-plus documentary The Journey (1987). -- Boris Nelepo's piece on Alain Resnais' Life of Riley, from a few months ago, now that the film has arrived on these shores. -- Dave Kehr has co-curated MoMA's latest festival of film preservation, which features a number of rare and interesting items. -- A recent discovery: The Third Rail Quarterly. -- In the New York Times: "The Disheartening GamerGate Campaign". -- At Jacobin magazine: "In Mexico and elsewhere, neoliberalism isn’t a retreat of the state. It’s using the state to enrich the wealthy." Also at Jacobin, two critiques of the new "sharing economy": "Sharing and Caring"; and "Against Sharing". -- On a personal note, I am looking forward to this concert by "experimental hip-hop" artists DJ Shadow and Cut Chemist in tribute to Afrika Bambaataa; I've long admired their work. From DJ Shadow's website: "Using only vinyl pulled from Bambaataa’s historic collection – over 40,000 strong and permanently archived at Cornell University – DJ Shadow and Cut Chemist aim to present Bambaataa’s legacy in all its genre-busting and socially-minded complexity." I encountered this joke as part of a Facebook meme in the aftermath of the 2008 crisis. The situation in the joke resonates with the film’s story—even though the Dardennes said in their Q&A that they first had the idea for the project ten years ago. The plot is simple, even schematic. The sixteen employees of a firm that makes solar panels (a nice irony) are given a choice between receiving a 1000-Euro bonus or preventing the layoff of a fellow worker (Sandra, the protagonist, played by Marion Cotillard). They vote for the former option, and Sandra spends a weekend tracking down several co-workers one by one, pleading with them to change their vote so she can keep her job. This film hit me especially hard because of a personal reason: in the last year, I have been trying to use the phenomenon of neoliberal capitalism—and its wide-ranging, calamitous impacts on society and the environment—as a master paradigm to structure some of my courses. The situations, contradictions and ironies put in place and developed by the movie speak powerfully to our present moment: this is ‘contemporary’ cinema at its most urgent and jolting. If the film was merely illustrative of neoliberalism and its effects, it wouldn’t be very interesting in aesthetic terms. But the Dardennes have designed a work crammed with detail—a lot of it open and suggestive but not conclusive. For example, Sandra has been marked for layoff because she has recently returned from sick leave due to struggles with depression. Can her depression itself be traced to alienated labor or did it pre-exist her work? Why exactly is she being fired? Is it because she might be, due to her recent illness, a less than perfect ‘working machine’? Questions such as these are quietly signalled by the film and left suspended. The Dardennes have spoken in interviews about the influence of the philosopher Emmanuel Levinas on their work. I’ve not read Levinas but accounts of his philosophy repeatedly stress the ethical and affective importance of the encounter—specifically face-to-face—between one human being and another. It is important (and moving) that Sandra travels and seeks out her co-workers one by one and has a personal meeting with each one. (In a quietly humorous instance that comments upon her quest, she arrives at a co-worker’s house to find that he’s not home, speaks to him through his wife’s cell phone, and then accidentally runs into him in person later—the encounter now ‘complete’.) Each meeting and each worker are subtly, imaginatively individuated, and the film succeeds in great part because of this sustained inventiveness. Amour Fou (Jessica Hausner, Austria). The most ‘perfect’ film I saw in Toronto. There were others that were more complex and challenging (Goodbye to Language, Horse Money) but this one struck a certain droll balance between aesthetics and politics: between a carefully detailed form and a quiet but insistent political analysis. The film is a satirical comedy set in the early 1800s in which real-life German writer Heinrich von Kleist attempts to convince a housewife to join him in a double suicide. This narrative pretext permits Hausner to evoke a world—that of the Prussian bourgeoisie in Berlin—and sketch, beneath the narrative, a diagrammatic view of a society, its structure, and its invisible lines of hierarchy. The formal design of the film is distilled and exact: every image contains an idea—or gestures toward one. Amour Fou’s strategy is to tightly connect film form to social formality, thus expressing something about—commenting upon—the world it depicts. The film opens with a close-up image of a bright shock of yellow flowers: Henriette the housewife is arranging them meticulously, but because of the camera angle, she is almost totally obscured by them. The film is full of formal rituals that also simultaneously stage the playing out of social roles and distinctions: dinner parties (with solemn musical performances following), decorous parlor conversations, a ceremonial dance. A hierarchy is outlined not just through the visual dimension of this film’s social mise en scène, but also in speech: specifically, when certain people get to speak for others. Heinrich, in trying to convince Henriette to die with him, declares to this woman he barely knows, “You love nothing; nobody loves you.” (She is silent in reply; her circumscribed and regimented life as a housewife also means that there is a grain of truth to this presumptuous assertion.) When she falls ill, and is treated by a doctor and a hypnotist, she does not speak; she is merely an object, a surface, upon which ‘science’ is imposed and practiced. At a dinner party, a wealthy Prussian bemoans the harmful after-effects of the French Revolution, and announces that peasants will not know “what to do with their freedom”. The finale (I won’t reveal it here) literalizes the erasure of a woman’s speech by a man, by way of a sly allusion to Bresson’s Le Diable Probablement. This is also a great film on the theme of ‘the artist as narcissist’. Heinrich wants Henriette as a partner in suicide not because of some spiritually or erotically exalted reason but because of pure selfishness: his ego craves the satisfaction of having a woman give him her most precious possession, her life, for no other reason than that he asked her for it. Here is a good interview with Hausner in which she points out what interested her about the real-life story on which the film is based: "Kleist had apparently asked several people whether they wanted to die with him–his best friend, a cousin and then ultimately Henriette Vogel. I found that a little grotesque. He gave this romantic, exaggerated idea of double suicide for love a banal, slightly ridiculous side." -- The latest (and third) issue of the journal [in]Transition is edited by Catherine Grant, and features curatorial pieces by her, Cristina Álvarez López, Adrian Martin, Ian Garwood and Miklos Kiss. Also check out the great comment threads with Cristina, Adrian, Pam Cook and Christian Keathley (among others). -- Another wonderful gift of reading, watching and listening from editor Catherine Grant: the new website The Audiovisual Essay, featuring Cristina, Adrian, Catherine, Christian, Vinzenz Hediger, Carlos Losilla and others. -- The new issue of Senses of Cinema includes a large and terrific tribute to the Australian scholar/critic/cinephile John Flaus. -- RIP Peter von Bagh, cinephile par excellence. "Masters of Cinema Under the Midnight Sun," a big book of interviews conducted by Peter von Bagh over the years, will be released soon. -- From the Film Comment archive: Kent Jones on Hou Hsiao-hsien, "Cinema with a Roof Over its Head". Also, J. Hoberman on Hou at the New York Review of Books. -- Tony Zhou's latest video essay, "David Fincher: And the Other Way is Wrong". -- "The Pedagogies of Reading and Not Reading" by Jesse Stommel at Hybrid Pedagogy, via Katie Bird on Twitter. -- The Cinéastes de notre temps episode on Robert Bresson is on Youtube, with English subtitles. Thanks to Catherine Grant for the tip. -- Matt Zoller Seitz: "Why my Video Essay about All That Jazz is not on the Criterion Blu-ray". Also: some reports on degradation of Criterion Blu-rays, via Brad Stevens. -- Darren Hughes and Michael Leary have a conversation about the films of Claire Denis at the site To Be Cont'd. Here's part one; part two; part three; and part four, which is an interview with Denis herself. -- Ricky D'Ambrose on "immersive theater" at The Nation (via David Hudson). -- An interview with Rosi Braidotti about speculative realism, at Frieze Magazine. -- "Liberalism and Gentrification" by Gavin Mueller at Jacobin. -- Finally: I want to send my best wishes to a friend, Lina Rodriguez, whose first feature film, Señoritas, has just been released. It was set and shot in Colombia; here is an interview with her at Film International.